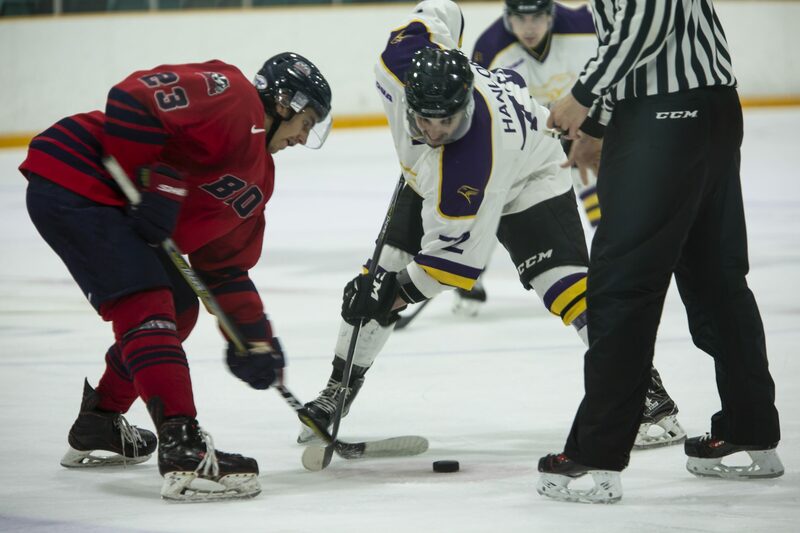 It has been an up and down season so far for both the men’s and women’s Laurier hockey teams. The men’s team lost a few veterans at the end of last year and it seems like their leadership was certainly being missed by the Hawks, at least at the start of the season. The Hawks got off to a slow start with an 0-4 record, but ever since that fourth loss to the Carleton Ravens, the team has shifted into another gear. Since that 0-4 start, the Hawks’ record has been a very respectable 5-4, bringing their overall record to 5-8. But this is a team that is seemingly on the rise. The defence and goaltending have gradually improved, and that has been the key behind the Hawks’ turnaround. With the Hawks losing both of their goaltenders from last year, rookie Tyler Fassl has had to step up and become the starting goaltender for the purple and gold. It hasn’t been easy for Fassl, but his play has clearly improved game after game. In terms of statistics, the numbers look similar to last year for the Hawks, as it is Brandon Robinson leading the team in points once again. It’s been a tougher start for the women’s team under new head coach Kelly Paton. The women’s team lost against the University of Toronto on Sunday by a final score of 1-4.The Varsity Blues simply outmatched the Hawks and put on an offensive showcase. The team’s level of play, however, has been steadily improving even if their record doesn’t show it. Similar to the men’s team, the Hawks got off to a rough 0-4 start, but they have been clawing their way to some impressive victories since then. The Hawks picked up their first victory under Paton in Windsor on Nov. 3 by a score of 3-0, and then they won a thriller against the Warriors in the “Battle of Waterloo” on Nov. 9 by a score of 3-2. The Hawks’ record is now 2-6-1 and although many fans would want to see a better win percentage, it’s important to realize that this is still a young team under a new head coach, coming off 5-16-3 season. Realistically, fans should hope to see growth and development within this talented roster, and so far in 2018, you can make a case that this team has taken a lot of steps in the right direction. The veterans Kaitlyn Hatzes and Madison MacCulloch have led the way offensively, and they will need to continue to play at a high level in order for the Hawks to keep winning games. The women’s team will take on the Queen’s Gaels in their next game on Friday at the Waterloo Recreation Complex at 7:00 p.m. Both the women’s and men’s hockey teams suffered difficult losses over the weekend.The men lost against York in a hard fought battle. The Hawks tied the game up at 3-3 heading into the third and final period, but the Lions proved to be too much as they put the Hawks away with a clutch go-ahead goal. For the men, it’s the “Battle of Waterloo” next as they will face the Warriors in Laurier’s annual “School Day Game” on Wednesday at the Kitchener Auditorium. Puck drop is set for 11:00 a.m. There are plenty of games left in the season for both teams to turn things around.